How often do you find yourself scrambling to put together dinner? Are you tired of relying on pizza or grocery store rotisserie chickens to bail you out when there's nothing thawed in the fridge? A few years ago, I was lucky enough to latch onto a group of women interested in transforming their families' dinner time experience. Once a month, we'd spend 3-4 hours preparing 10-12 delicious freezer meals in our individual homes. Then, we'd meet at a designated location and exchange our meals with each other in a 15-20 minute "meal swap." I'd drive home a cooler filled with entrees and side dishes, all prepped and ready to hang out in my freezer until I thawed it for dinner. We enjoyed meals like dijon pork loin with Israeli couscous, Monster Meatballs, Chicken Enchiladas with salsa rojo, chicken fajitas with all of fixings, Million Dollar Spaghetti and so much more! Not only did our family enjoy great dinners without the epic mom-meltdown, but our meal swap group also discovered how our meals would make a difference. In this Part 2 episode with Laura Bell and Alison Frye, we'll share more stories about our meal swap experience and how we used meal swap to bless our neighbors, friends, people at church and even families overseas. Would you like to host a meal swap group in your neighborhood or at your church? Download the first 12 pages of our cookbook, Never Make Just One. We provide step-by-step instructions so that you can successfully set up and launch your own meal swap group. Give it a try! Click here to download the free sample. We've included a sample recipe for you to try! WANT TO BUY THE ENTIRE COOKBOOK? Here's a link to the entire cookbook. You can purchase it for $5.00. All of the proceeds will benefit mothers and children served by our Moms on Mission team traveling to Honduras this summer. Ahhh, the daily question that haunts mothers all across America. It's well-known that 4pm-7pm is a mother's least favorite time of day. Between after-school or daycare pick-up, sports practices or music lessons and figuring out homework, tired mamas often dread tackling dinner time preparation. As much as we'd love a hearty, healthy homecooked meal, what we want more is someone to make it for us! But, what if you could enjoy a great home cooked meal with your family without all of the dinnertime craziness? On today's Better Together podcast, we're going to talk about something that revolutionized dinner at my house. In fact, if I'd found out about this 20 years ago, our family would have eaten at home much more often and I would have cried a lot less! 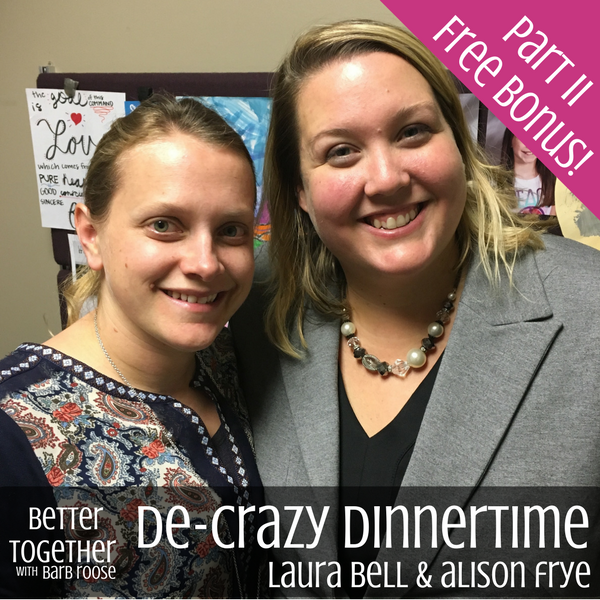 Join me and my friends, Laura Bell and Alison Frye as we talk about meal swapping. This concept began as an experiment, but soon, it changed our lifestyles and transformed our families' dinner time experience. This two-part episode also includes a great bonus! You can download the first 12-pages of our cookbook, Never Make Just One. You'll get all of the details on how to begin a meal swap group in your community, plus we include one of Laura's recipes from the cookbook. SPECIAL OFFER! 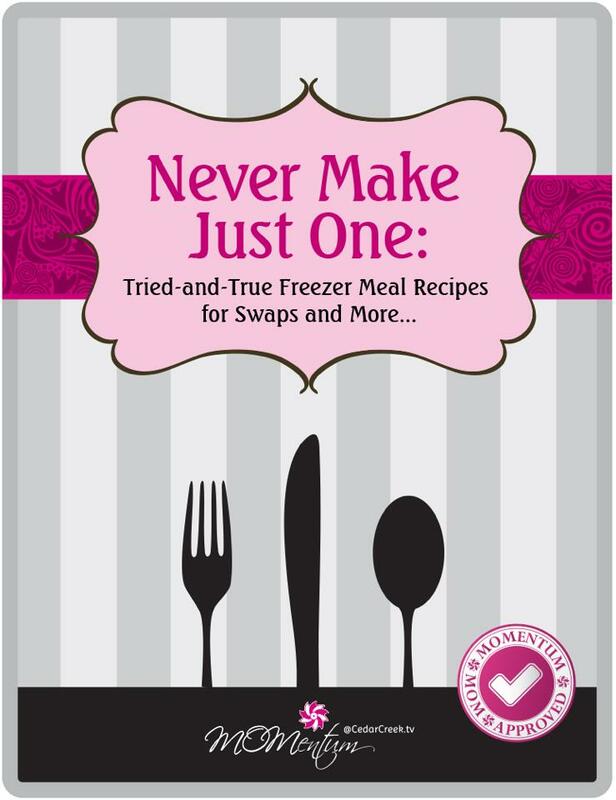 If you'd like to purchase the entire Never Make Just One cookbook for $5.00, 100% of the proceeds will go toward helping moms and babies in Latin America when our Moms on Mission group heads to Honduras this summer. ...a loved one's salvation or freedom from an addiction. Whenever we pray, we do so with the expectation that God will answer our prayer in some way. But, what do we do when it seems like God isn't doing anything at all? Speaker and author, Marlo Schalesky grappled with this question during her 20-year battle with infertility. 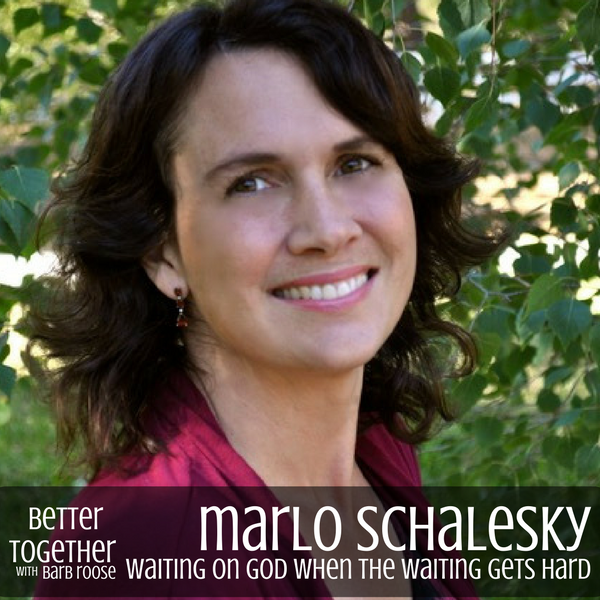 During this new episode of the Better Together Podcast, Marlo and I about what she's learned about waiting on God when the waiting gets hard. We talk about her new book, Waiting for Wonder and what we can learn from Abraham's wife, Sarah's long wait for baby. gritty conversation is a no-hold bars honest reflection on how God can handle our heartache while we wait for His divine purposes to be fulfilled in our lives. This gritty conversation is a no-hold bars honest reflection on how God can handle our heartache while we wait for His divine purposes to be fulfilled in our lives. As you listen to the podcast, if you know of a woman who's been struggling with waiting on God, especially one struggling with infertility, share this podcast privately with her. Marlo Schalesky is an award-winning author of 10 books, including both fiction and non-fiction. Her novels have garnered the high honors of the Christy Award and ACFW Book of the Year. Schalesky’s non-fiction releases include Wrestling with Wonder: A Transformational Journey through the Life of Mary (Zondervan) and the latest, Waiting for Wonder: Learning to Live on God’s Timetable (Abingdon Press).